From a murder in Paris to a courtroom in California to a terrorist camp in the Gobi Desert, Don Brown’s follow-up to Treason and Hostage plunges into a suspense-filled journey of danger, duty, and hope. 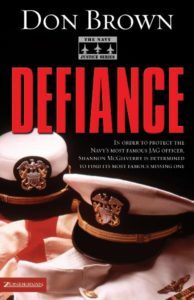 Shannon McGilverry, an NCIS agent, has been assigned to protect Navy JAG Officer Zack Brewer. Zack is being hunted by terrorists, stalked by a psychopath, and is working his way through a perilous, politically charged trial. When another Navy JAG officer is murdered, it’s clear how close the noose is to tightening around Zack’s own neck. And now the rumors surface that Zack’s ex-co counsel, Diane Colcernina, may still be alive. Determined to risk everything to find her, Zack finds himself in need of his faith more than ever as Navy SEALS launch a daring rescue attempt—one with the potential to trigger World War III. Enter the sum of 17 + 9	below to prove you are a human.